Soups are always a good opportunity to use up the random vegetables accumulating in the fridge that you swore you weren't going to let go to waste, again. Today I spotted half a bag of forgotten kale, a gigantic fennel bulb, and a lonely solitary leek stalk. 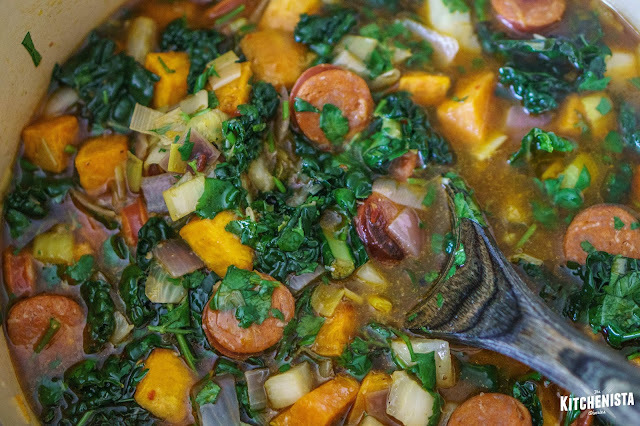 As I'd been lucky enough to snag a pack of sugar-free chorizo in my last farmer's market haul, my mind immediately went to a Whole30 compliant Portuguese kale soup. 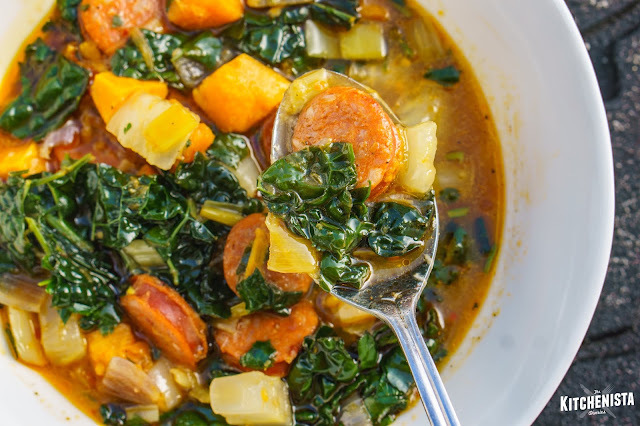 (In fairness, so long as kale is involved, I tend to gravitate towards some sort of spin-off of my favorite childhood soup.) After scanning what was actually available in the pantry, I went with sweet potatoes instead of white potatoes, brightened the flavor with cilantro and lemon, and spiced things up with a healthy shake of crushed red pepper. 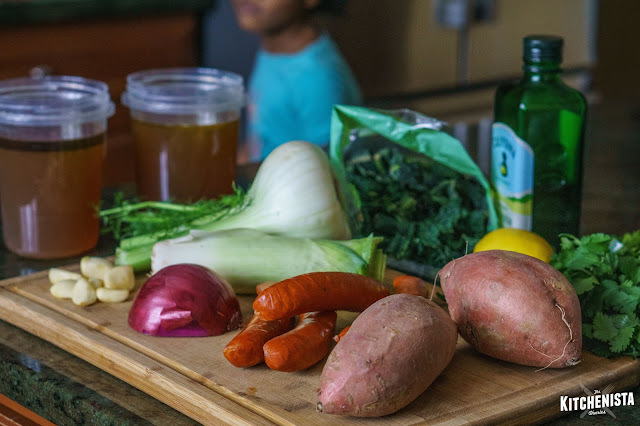 It's decidedly not Portuguese kale soup, but the beauty of kitchen sink soups is in ending up wherever you happen to land. 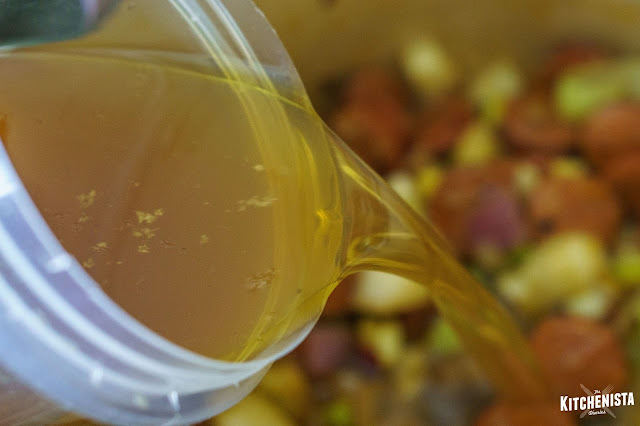 The key here, in case you aren't yet tired of me nagging you about it, is to take advantage of the liquid gold that is homemade chicken stock. Keep a few quarts of stock frozen for a rainy (or snowy) day, and you'll never be far off from an amazing soup no matter what you throw into it. *Note: Recipe instructions are for smoked chorizo sausage links, not ground chorizo, which is a different flavor profile and comes raw. The best substitute for the flavor of Spanish chorizo is Portuguese Linguiça, another type of cured sausage. 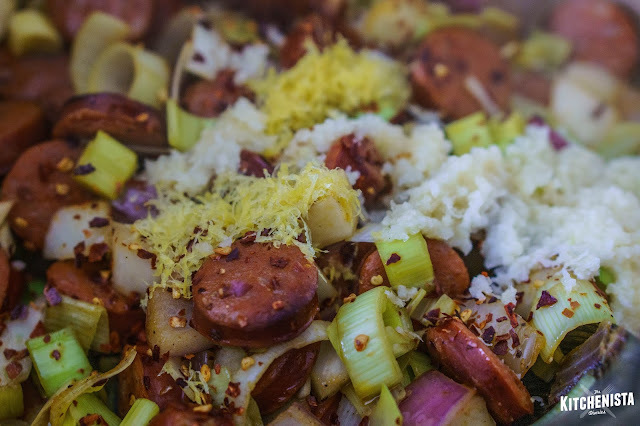 If preparing this recipe for Whole30, check the chorizo ingredients to make sure it doesn't contain sugar. Sweet potatoes have a tendency to fall apart pretty easily in soup, so I like to roast them in the oven instead. They'll hold their shape better in the finished soup. 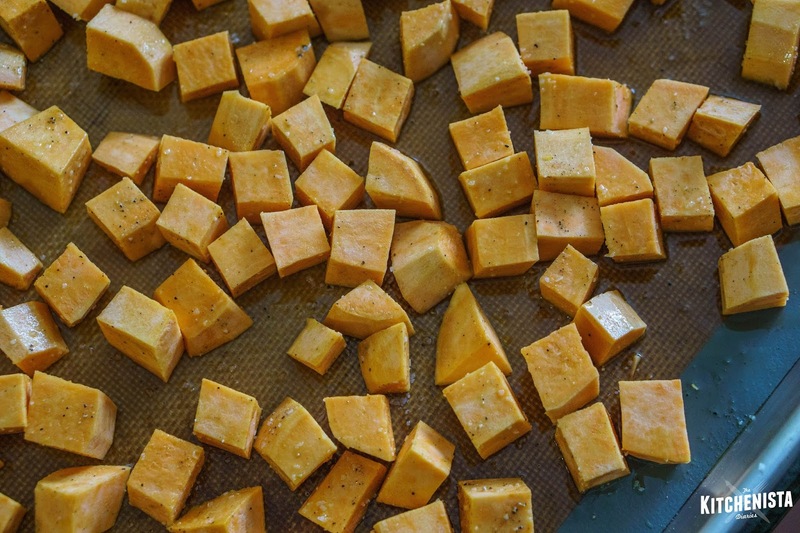 Simply toss the diced sweet potatoes with a light drizzle of olive oil and a sprinkling of salt and pepper. 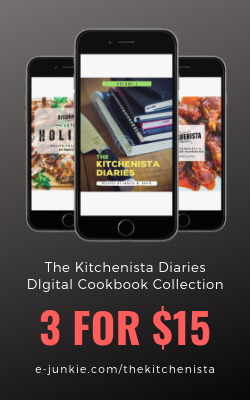 Spread out on a parchment or silicone lined heavy duty sheet pan. Roast in the oven at 400°F for about twenty minutes, until edges are starting to crisp. If you start with this step, the rest of the soup will be done on the stove top around the same time! 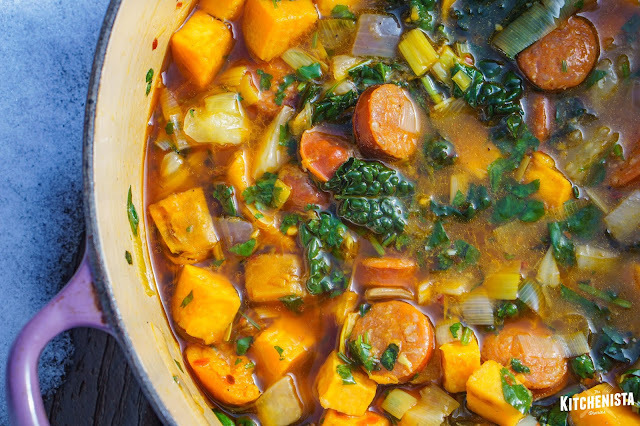 Over on the stovetop, coat the bottom of a heavy pot or Dutch oven with a generous swig of olive oil. 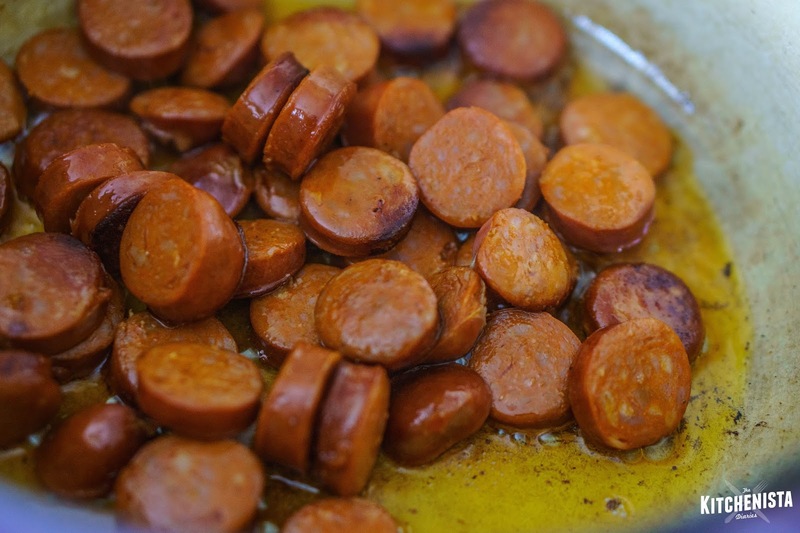 Cook the sliced chorizo sausage for a couple of minutes over medium heat, just until they start to brown. 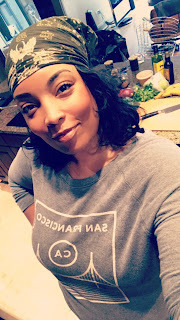 My daughter always sneaks into the kitchen looking for handouts when the smell of sausage hits the air! 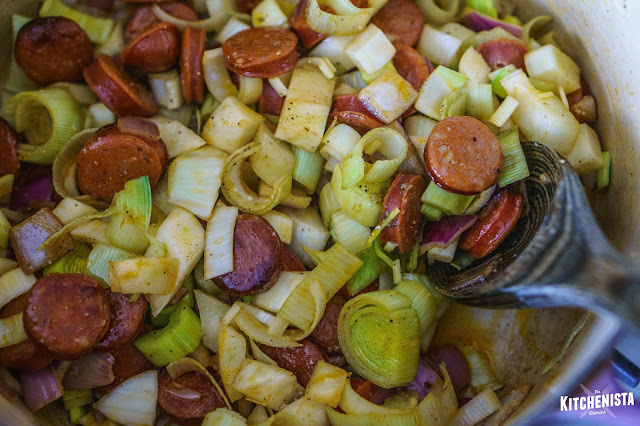 Add the chopped onions, fennel and leeks to the pot. 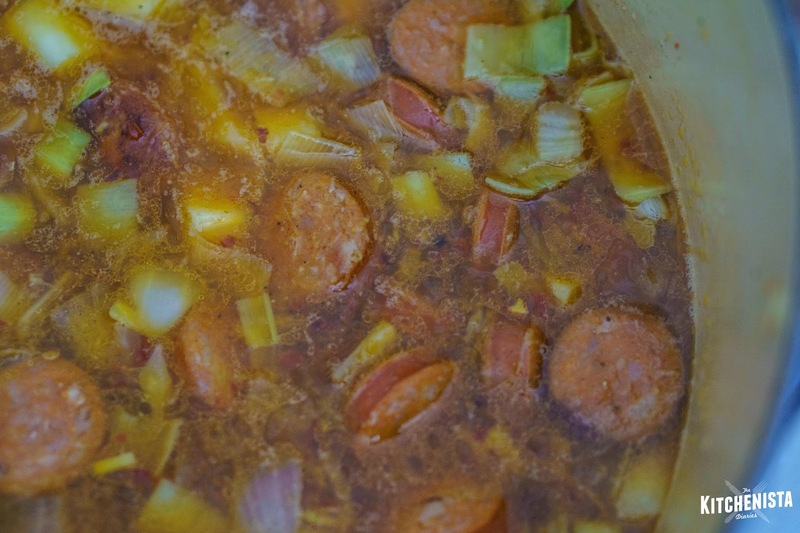 Cook, stirring frequently until the onions and fennel have softened, about 3 or 4 minutes. Season with a pinch of salt and pepper as you go. Note: When you have a fresh leek, slice the stalk in half vertically first. Make sure to do a thorough job of rinsing all the layers in cool water before slicing. Lots of dirt can be trapped in there. Stir in the grated garlic, lemon zest, and crushed red pepper flakes. Cook for another minute, until fragrant. Chorizo ranges from mild to very spicy, so it's a good idea to taste what you have before deciding how much more heat to add. I enjoyed a very spicy version of the soup! Next, pour in all of your chicken stock, scraping up any browned bits at the bottom of the pot. I made this batch of stock in my pressure cooker using chicken backs and chicken feet. It was glorious. Turn up the heat slightly and bring the contents of the pot to a gentle boil. Then reduce to low heat and simmer for five minutes. Season to taste with salt and pepper. 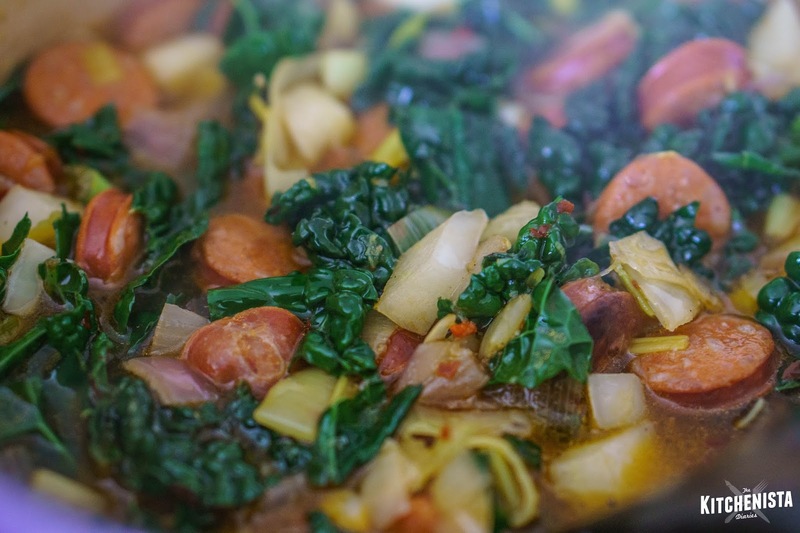 The chopped kale can be stirred into the pot now. Let it simmer for another few minutes. I really love using Tuscan kale (also called Lacinato or Dinosaur Kale), because it's tender and wilts very quickly while maintaining some bite. Tender collard greens or spinach would also work well in this recipe. 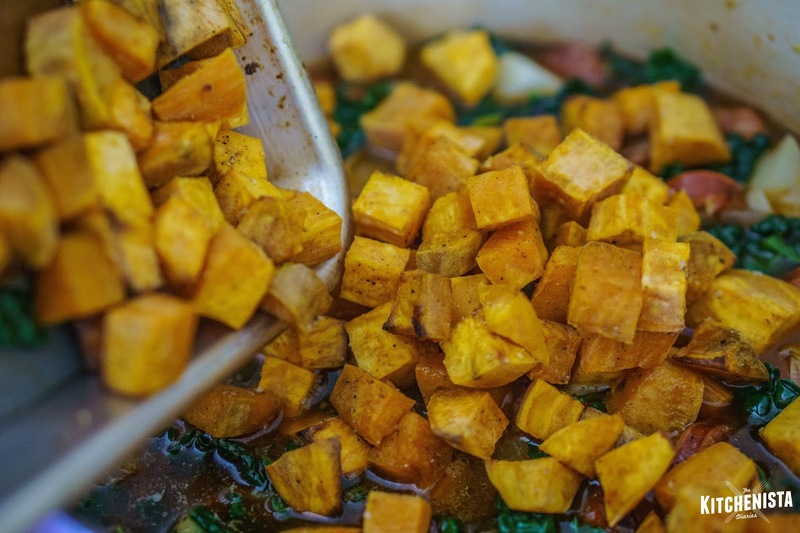 Transfer the oven-roasted sweet potatoes to the pot and stir gently to distribute evenly throughout the soup. 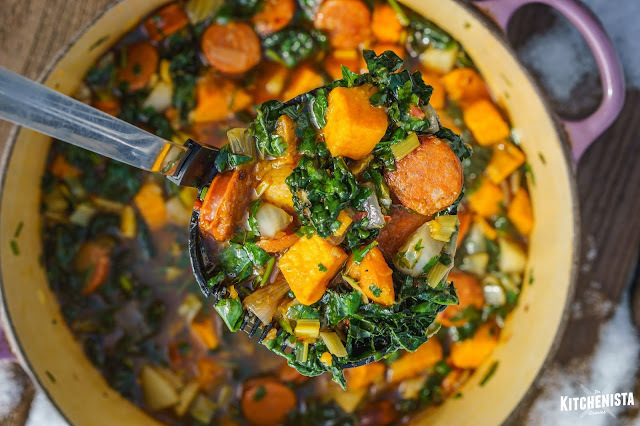 Note: If roasting isn't an option for you, the diced raw sweet potatoes could be added to the soup at an earlier point, prior to adding kale. You'd want to simmer the soup just until the potatoes are tender. Finally, stir in the chopped cilantro and lemon juice. Cook just until the cilantro wilts, which should only take a minute. Do a final taste test for salt and pepper before serving. I couldn't wait to dive into this soup. 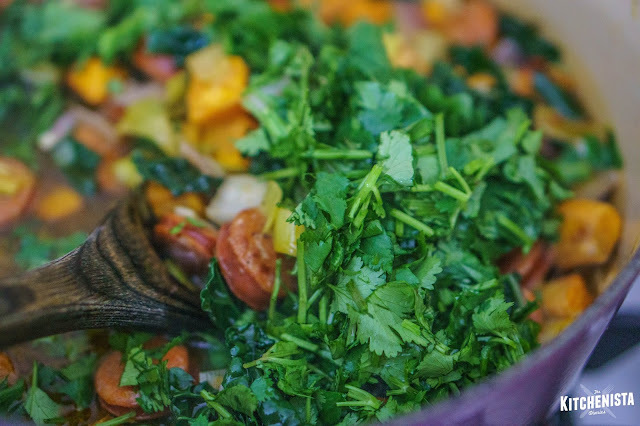 The spicy chorizo was balanced by the sweet potatoes, and I loved how the cilantro and lemon took things in a slightly different direction than the flavor profile I usually go for. This was a satisfying, easy meal that's gotten even better for leftovers as our snowy week continues on!